Does your Kyocera or Sonim phone come with a programmable or push-to-talk button? With Orion AppTalk Plus, you can push-to-talk across any distance, plus do a lot more, with your phone's PTT button. What is Orion AppTalk Plus? AppTalk Plus brings walkie-talkie-style communication to your rugged phone — across any distance, across any carrier network, and over Wi-Fi. Talking to your team is as simple as pushing the dedicated PTT Button on your Sonim or Kyocera phone*. AppTalk Plus connects you to anyone on Orion, whether they're using Onyx smart walkie-talkies or AppTalk. Choose the way that makes the most sense for each person on your team. Who is AppTalk Plus for? AppTalk Plus makes it easy to communicate near-instantly with teammates who might be working at other locations, doing hands-on work, driving, or doing other work that requires complete focus. AppTalk Plus also works with select accessories for these phones. 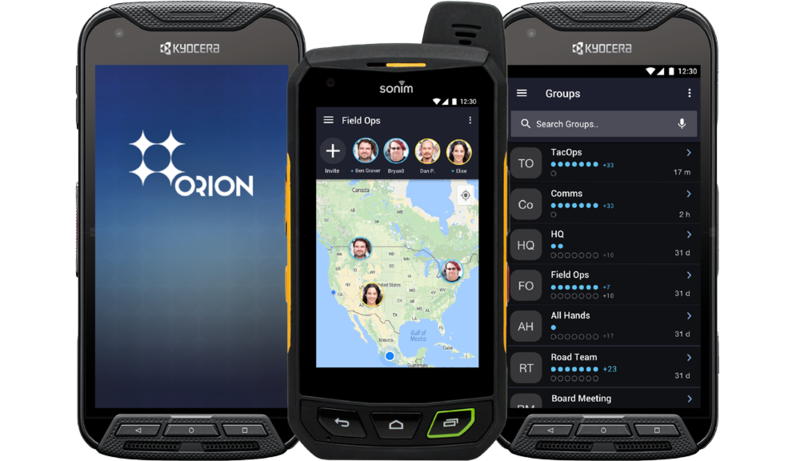 Looking for Team Communications on your Rugged Smartphones? Fill out the form to talk to one of our real-time communication specialists. Have questions or need help? Check out our knowledge base.